PASADENA, TEXAS (April 21, 2019) The 46th Annual Pasadena Strawberry Festival, scheduled for May 17-19, 2019, promises three days of fun-filled enetrtainment, activities, and events at the Pasadena Municipal Fairgrounds, located at 7902 Fairmont Parkway in Pasadena, Texas. This year's events include three days of concerts, along with carnival rides and games, a petting zoo, in addition to a car, truck and motorcycle show, and the world's largest strawberry shortcake. The festival begin on Friday, May 17, from 3 p.m. until 12 midnight. Saturday, May 18 activities will begin at 10 a.m. and end, again, at 12 midnight. Sunday, May 19 events will run from 10 a.m. until 6 p.m.
On the main stage, entertainment is scheduled for all three days, beginning on Friday with Escape, a Journey tribute band from 8-9:30 p.m. Following at 10 p.m., Bag of Donuts will perform a one-and-a-half hour concert. Saturday sees four performers taking the stage; including Justin Taylor (3:30-5:30 p.m.), Dalton Domino (6-7:30 p.m.), Randall King (8-9:30 p.m.) with Josh Ward rounding out the evening's enetrtainment from 10-11:30 p.m. The Samy Jo Band will preform on Sunday from 3-5 p.m.
Free parking will be available at San Jacinto College with free shuttle rides from the college to the fairgrounds. Discount admission tickets can be purchased at www.strawberryfestival.com. 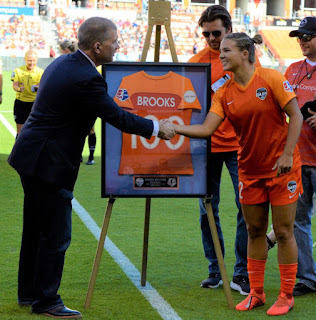 HOUSTON, TEXAS (April 20, 2019) The Houston Dash and Sky Blue FC battled for 83 minutes, after which midfielder Sofia Huerta broke the scoring drought to give Houston a 1-0 win on Saturday evening. The fleet-footed Heurta left-footed the ball past Sky Blue goalkeeper Kailen Sheridan from outside the box, to the bottom left corner. It was the first goal of the season for the 28-year-old who played her college soccer for the Santa Clara Broncos. The win gave the Dash three points, pushing their season total to four and third place in the current NWSL standings. The Dash took 11 shots on goal; 10 more than Sky Blue could manage. Houston controlled most of the game; including shots (19-8), blocked shots (3-2), corners (8-3), crosses (21-8), and total passes (496-418), and possession (54-7%-45.3%). Two yellow cards were issued during the match. The first was to Dash defender Lindsay Agnew in the 49th minute and to Sky Blue midfielder Carli Lloyd; both for "unsporting behavior." At the 63rd minute, Houston midfielder Kristie Mewis entered the game for Agnew, stepping foot on the field for the first time since her knee injury last May. Along with Mewis, forward Jamia Fields entered the game for midfielder Sophia Schmidt, making her Dash debut. 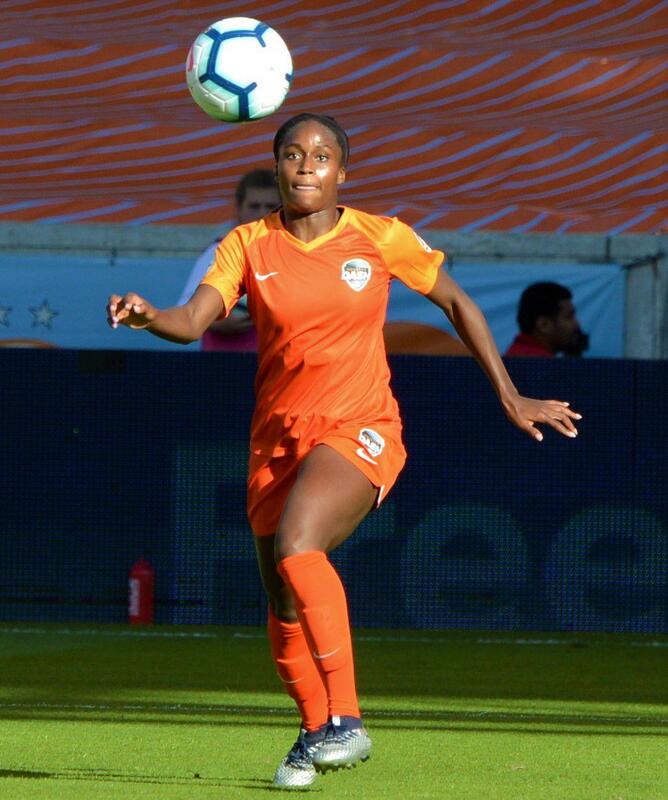 LOS ANGELES, CALIFORNIA (April 19, 2019) The Houston Dynamo dropped their record to 4-1-1 (13 points) with a 2-1 loss to the LA Galaxy at Dignity Health Sports Park in Carson, California on Friday evening. The Galaxy scored in the 31st minute on a penalty kick by Zlata Ibrahimovic. The Dynamo responded with their own penalty kick by forward Alberth Elis in the 53rd minute. Diego Polenta nailed the game clincher in the 88th minute to give Houston their first loss of the season. Elis scored for the fourth consecutive game when he converted the penalty kick. The scoring streak is the longest of his MLS career. In addition, he improved to five-for-five in his MLS career on penalty attempts and started for the 50th time in league play with the Dynamo and made his 61st career league appearance. Midfielder Boniek García made his 201st appearance for the Dynamo in all competitions this evening, which placed him in a tie with former Houston FW Will Bruin for sixth on the club’s all-time list. TheDynamo and the Galaxy each had 13 shots in the game. It was the first time this season that the Dynamo and their opponent were level on shots. Houston’s 450 total passes were the second-most in a game this season, behind only their 494 passes against Montreal on March 9. The Galaxy struck first when Ibrahimovic converted the penalty kick. It was the third time this year that Houston conceded the game’s opening goal, and the Dynamo are now 1-1-1 in those games. Los Angeles also had the better of possession, holding the ball for 51.3 percent of the game. It was the fourth time this season that the Dynamo had less possession than their opponent, and they are now 3-1-0 in those games. The Dynamo return home to BBVA Compass Stadium on Saturday, April 27 to host Columbus Crew SC for the club’s inaugural End Cancer Night, presented by The University of Texas MD Anderson Cancer Center. HOUSTON, TEXAS (April 20, 2019) Against a new, perfect backdrop, the Houston Dash took on Seattle Reign FC at BBVA Compass Stadium on Sunday, April 14, 2019. The game also celebrated a milestone. Defender Amber Brooks (shown right) celebrated her 100th game in the NWSL. Brooks is a mainstay of the Dash defense and did not disappoint during the game. Her tenacity and new found confidence on the field and propelled the Dash to a 1-1 draw. In addition to the celebration, the Dash organization ushered in their newest head coach, James Clarkson. Clarkson’s entrance marks the end of the short lived Vera Pauw era. While Pauw wanted the fans, including the locally famed Bayou City Republic, to quiet down so the players could hear her, Clarkson has taken an opposite stance. Bayou City Republic was allowed to let loose and hype the fans up. For those unfamiliar with the Dash, Bayou City Republic is to the Dash, what the Texian Army is to the Dynamo. Coming with drums of all varieties, they bring banners and joyful music with them. They are the official host of the Houston Dash watch parties and keep the spirit alive during away games. With that being said, Clarkson is already making an indelible mark on the Dash. Players have said countless times that there is more club chemistry and that there are good vibes within the team. That is showing on the pitch. The passing game, while rough at times, has amazing potential. With the addition of a few new faces on the Starting 11 in Christine Nairn and Sophie Schmidt, it is easy to see how the passing game will evolve and get stronger as the ladies’ playing time increases. One potential Achilles heel could be the lack of strength at the midfielder level. Clarkson put Haley Hanson, traditionally a midfielder, in as a second half substitution for forward Nichelle Prince. It was easy to see she would need some work if she is going to transition to being a forward. In spite of this substitution, the mid-fielders looked tired in chasing the ball during the second half of the game. Hopefully, this area of play will gain the same strength and fighting power as the forwards. Overall it was a great outing for the Dash, holding the Reign to the 1-1 draw. Looking forward to this evening's game against Sky Blue FC, the Dash will face two-time FIFA Women’s Player of the Year, Carli Lloyd at 5 p.m. at Yurcak Field. HOUSTON, TEXAS (April 14, 2019) In a match that saw Nichelle Prince (shown right) get the first goal of the 2019 season, the Houston Dash battled to a one-all draw against Seattle Reign FC at BBVA Compass Stadium in Houston. The fleet-footed forward pounced on a loose ball in the 10th minute of the game; tucking it to the far post for the score. The Canadian as already matched her goal total for 2018, where she played in 19 games while starting in 11. The match was a back-and-forth affair, with the Dash holding the lead until the 58th minute, when Darian Jenkins shot from the top of the box. The ball was deflected and wrong-footed past Dash goalkeeper Jane Campbell for the goal; her first in a Reign uniform. In the 20th minute, Reign forward Jasmyne Spencer stretchered off the field with an injury. The injury, along with Prince's goal, slowed Seattle's control of the game. Houston played aggressively, with Rachel Daly and Kalia Ohai taking shots on goal that were either wide or blocked by Seattle. Darla S Tamulitis, La Vita Loco Photography by clicking here. With added time running out in the second half, Campbell saved the draw for Houston, when Reign FC forward was warded a penalty kick. Campbell blocked the shot to end the game. It block was Campbell’s fourth penalty kick save in the league, the second most in NWSL history. The draw earned one point for the Dash, in head coach James Clarkson's debut. In addition, the match was defender Amber Brooks' (shown left) 100th regular season appearance in the NWSL. She wa shonored prior to the game for the achievement. For their second game of the season, the Dash will travel to Piscataway, New Jersey to take on Sky Blue FC on Saturday, April 20, with a 5 p.m. CST at Yurcak Field. In their first match of 2019, Sky Blue fell 2-0 to the Washington Spirit. 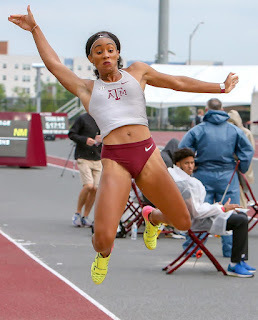 COLLEGE STATION, TEXAS (April 12, 2019) A trio of Aggie victories highlighted Friday’s portion of the Texas A&M Invitational among eight field events contested at E.B. Cushing Stadium. Tyra Gittens (shown right) claimed the long jump, Maddy Stulce won the women’s javelin and Sam Hardin bettered the field in the men’s javelin. Through four field events for the women the Aggies scored 48 points, which places them ahead of Houston (31), UTSA (20), Arizona State (18) and Sam Houston (14.5). The A&M men, through four field events, have scored 42 points to lead Houston (26), Sam Houston (20), UTSA (14) and Rice (12). Action in the Texas A&M Invitational continues on Saturday with field events starting at 3 p.m. while running events begin at 5:30 following an Aggie ring presentation at 5:15 p.m.
Gittens won the long jump with a leap of 20-9 (6.32) in the fifth round. She trailed the leading mark of 20-7 ¼ (6.28w) set by Houston’s Samiyah Samuels in the opening stanza. Gittens came within a quarter inch of the leading mark with a 20-7 (6.27) in the fourth round and then moved into the lead on her next attempt. Aggie teammates LaJarvia Brown and Virginia Kerley produced their career best marks in placing third and fourth. Brown had a windy 20-5 (6.22) in the final round, but also registered a wind-legal career best of 20-3 (6.17). Kerley improved upon her high school best of 19-7 ½ with a career best jump of 19-10 ¾ (6.06) in the third round and then had a barely windy best of 20-2 ¼ (6.15) in the fifth stanza. Taryn Milton finished eighth with a windy 19-3 ½ (5.88). Maddy Stulce won the javelin on her first round throw of 166-9 (50.84), and then improved to 173-2 (52.78) in the final round to secure a second consecutive victory at Cushing Stadium. Runner-up to Stulce was a 165-6 (50.44) by UTEP’s Roosa Yloenen. Celine Markert placed third in the javelin as she had another improvement in an event she just started this outdoor season. Coming into the meet with a best of 154-9 (47.18) from The Reveille last week, Markert bettered it in round three with a 158-4 (48.26) toss. Then she produced another five-foot improvement with a throw of 163-9 (49.91). Aggies also placed fourth and fifth in the javelin with Jenna Ellis (146-5) and Natalie Scheifele (141-3). Hardin led a 1-2-4 A&M finish in the men’s javelin as his opening throw of 236-10 (72.20) locked up his second victory at Cushing Stadium. Nick Mirabelli followed with a 220-6 (67.21) from the second round while William Petersson finished fourth with a mark of 204-2 (62.23). Rice’s Dane Stolsig placed third at 204-8 (62.39). A runner-up finish in the high jump by Mason Farley produced a clearance of 6-10 ¼ (2.09), which was just a quarter of an inch off his career best. Three attempts at 6-11 ½ (2.12) followed, but Farley and winner Elijah Hughes of Arizona State missed all three attempts. Alstian Walker made it over 6-8 ¼ (2.04) to place fourth while Jake Lamberth (6-6 ¼) and Mason Corbin (6-4 ¼) were eighth and ninth. Robin Nool, who will compete in the pole vault on Saturday, had a windy 23-8 (7.21) to finish fourth in the men’s long jump. Markert started the afternoon off with a throw of 167-11 (51.19) to place seventh in the women’s hammer. KJ Grimes placed ninth in the men’s hammer with a career best throw of 173-11 (53.03) as he remained in the No. 7 position on the A&M all-time list. Hunter Madore placed 14th with a toss of 150-10 (45.98). HOUSTON, TEXAS (April 10, 2019) In a match that lasted a bit over three hours, Christian Garin (right) defeated the number two seeded Jeremy Chardy 3-6, 7-6(4), 7-6(7) in second round play of the U.S. Men's Clay Court Championships at River Oaks Country Club in Houston, Texas. The 22-year-old Chilean saved five match points to upset the number two seeded Chardy. The match was was the fourth longest in U.S. Clay Court history. Garin is 5-0 in deciding sets this year and is headed into the quarterfinal to face Henri Laaksonen (Switzerland), who downed American Ryan Harrison 6-4, 7-5. HOUSTON, TEXAS (April 8, 2019) It is an occurrence that has not occurred since 1938. In that year, Seabiscuit beat War Admiral, the New York Giants beat the Green Bay Packers 23-17 for the NFL title, and the New York Yankees swept the Chicago Cubs in four straight games to claim the World Series. In addition, Bobby Riggs won his third consecutive U.S. Men’s Clay Court Championship title. At River Oaks Country Club in Houston, Steve Johnson, who was the champion in 2017 and 2018, will attempt to the match Riggs’ success in winning the 2019 title. Play at River Oaks kicks off on Monday, with Johnson slated to begin take to the court on Thursday, as the number one seed. He will face the winner of the Daniel Elahi Galan (Columbia) versus Paolo Lorenzi (Italy). The Galan-Lorenzi match will be on court three on Tuesday, April 9 with a 12 noon CDT start. This is the second ATP Tour tournament at which Johnson has held the number one seed. His other top seeding was at Newport in 2016. He is 11-4 lifetime at River Oaks, winning his last nine matches. The 29-year-old Johnson, who is ranked No. 39 in the world, is coming off Round of 64 loss to Joao Sousa at the ATP Masters 1000 Miami. In the same tournament, Johnson teamed with Marcel Granollers; losing in the doubles bracket to Nikola Mektic and Dominic Thiem. In the 2017 Clay Court Championship, Johnson downed Thomaz Bellucci (Brazil) 6-4, 4-6, 7-6(7-5) for his first title, following up with a 7-6(7-2), 2-6, 6-4 win over Tennys Sandgren in 2018. Bill Tilden won six consecutive clay court championships from 1922 to 1927, in addition to the title in 1918. Since the championship has been held in Houston, Andy Roddick has won three titles (2001, 2002, 2005) and Juan Monaco has two (2012, 2016). the final qualifying matches for the 2019 Fayez Sarofim & Co. U.S. Men's Clay Court Championship at River Oaks Country Club were suspended and postponed. Play will resume on Monday, April 8 with the matches suspended on Sunday, with play beginning at 12 noon CDT. First round matches scheduled for Monday will kick off at the regular posted time of 3 p.m.
Two former U.S. Clay champions headline the first night session at River Oaks Country Club. Ivo Karlovic, who won the 2007 title in the event's last year at Westside Tennis Club, opens play at 3 p.m. against Ryan Harrison. Marcel Granollers, who won the following year when the tournament moved to River Oaks, will play 2018 semifinalist Taylor Fritz at 6 p.m.
One other former U.S. Clay winner is in action Monday, with 2009 singles champion Lleyton Hewitt playing doubles with fellow Australian Jordan Thompson against the second seeded team of Austin Krajicek and Artem Sitak. 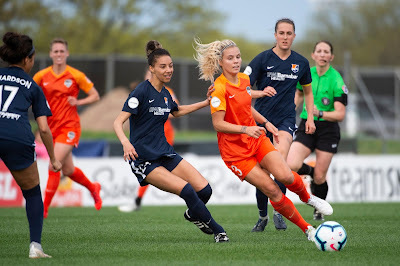 HOUSTON, TEXAS (April 7, 2019) On Saturday, April 30, the Houston Dash faced off against the Texas Tech women's soccer team at Houston Sports Park in their final tune up test prior to their 2019 campaign. That is exactly what his team did. Goals were scored by NWSL veterans Kealia Ohai (No. 7 above) and Sophie Schmidt as well as rookies Jamia Fields and Cece Kizer. The Dash’s passing game is improved greatly over last year’s open practice and the new leadership’s visions are being recognized. The Texas Tech goalkeeper, Marissa Zucchetto, had her hands full as the Dash peppered goal attempts time and time again. She was able to deflect many of these attempts only allowing the five goals. This year’s open practice scrimmage was very well attended. Fans enjoyed music, balloon animals and free shirts. The team stuck around after the practice to sign autographs and encourage everyone to come out to the season opener. 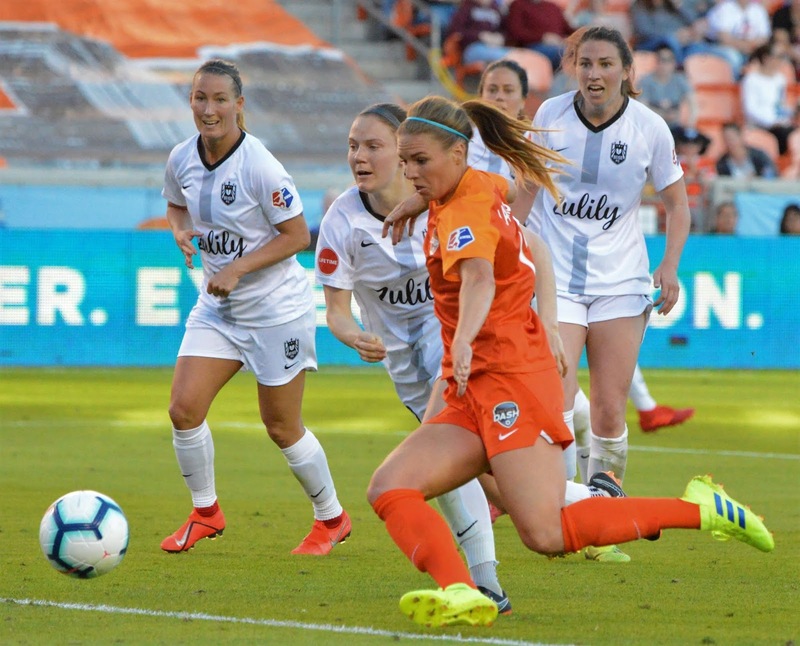 The Dash will kick off their 2019 season against the Seattle Reign on Sunday, April 14 at BBVA Compass Stadium, with a 5 p.m. CDT start. 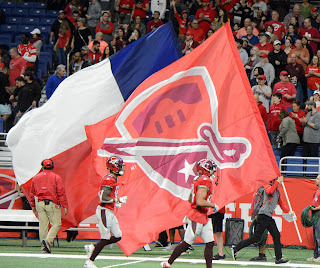 SAN ANTONIO, TEXAS (March 31, 2019) It was a hard Sunday night at the Alamodome for the San Antonio Commanders. With their offense unable to overcome the Arizona Hotshots defense, they dropped a 23-6 decision in front of 23,504 fans in the Alamo City. With the loss, and the Arizona win, both teams now post 5-3 records, with the Wildcats holding the advantage for the home field advantage in the playoffs. With two games to go in their inaugural Alliance of American Football season, the Commanders will have to win their final two games, with Arizona dropping one of the them to be able to have the fans in San Antonio witness the playoff game inside the Alamodome. The game started off with the Hotshots scoring on their second possession of the game; a four-play, 80-yard drive that ended when John Wolford (below, number 7), connected with Radhad Ross on a 58-yard pass for the first touchdown of the game. The conversion attempt failed to put the score at 6-0 after 5:42 of play in the first quarter. They added three more points, with a Nick Folk 25-yard field goal at the 14:26 mark of the second quarter. The Hotshots capped another long drive for their second TD of the game with a six-yard run by Tim Cook, San Antonio responded with 47 seconds left in the half with a 54-yard field goal by Nick Rose. Both teams headed to the locker room at halftime with the Hotshots leading 15-3. San Antonio took possession of the ball to start the second half; driving 58 yards in 11 plays to add three points to their total when Rose booted his second field goal of the night; a 35-yarder. The field goal was the only score on the third quarter, with Arizona taking a 15-6 lead into the final 15 minutes of play. The Hotshots added an insurance touchdown Cook scampered over right tackle for 20 yard and his second touchdown of the game. The conversion attempt, a pass from Wolford to Conner Hamlett, was successful, to close out scoring. In week nine, San Antonio will host the 2-6 Memphis Express while Arizona will host the Birmingham Iron (5-3). The final week of the regular season will see the Commanders travelling to Salt Lake while Arizona will travel to San Diego to play the Fleet. 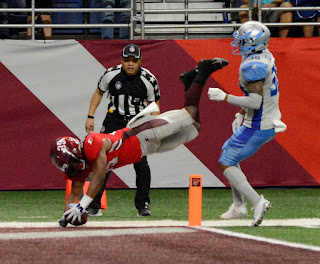 SAN ANTONIO, TEXAS (March 23, 2019) With 1:54 remaining in the game, the Salt Lake Stallions trailed by two after their only touchdown of the night. 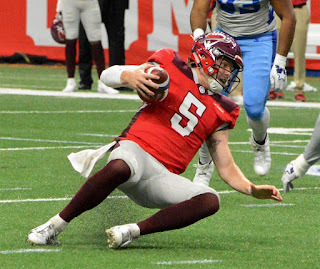 Going for the two-point conversion, quarterback Josh Woodrum targeted wide receiver DeMoenay Pierson-El for the tie; with the pass picked off by San Antonio Commanders' De'Vante Bausby. 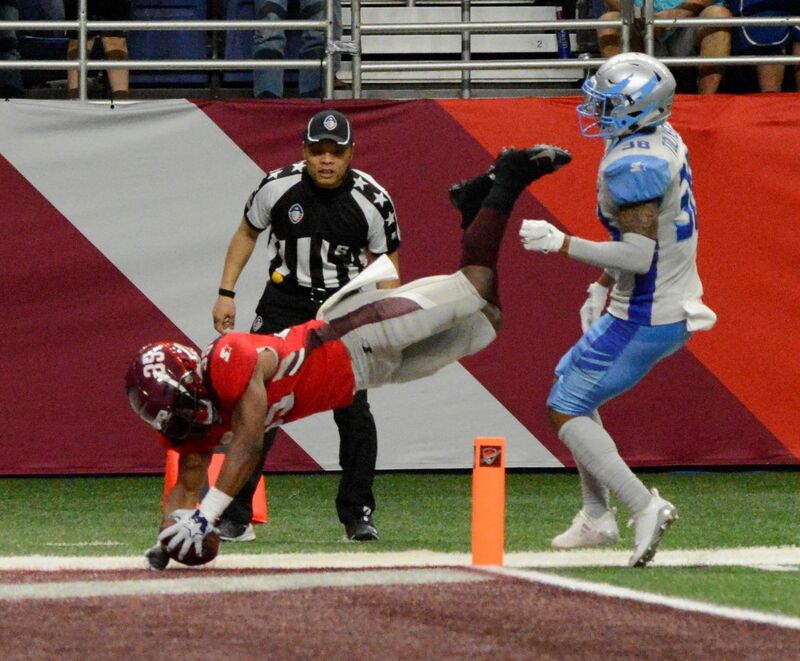 The fleet footed corner back ran the ball back, scoring two points to seal the deal and give San Antonio a 19-15 win over Salt Lake at the Alamodome in San Antonio. The win pushes the Commanders to a 5-2 record, good enough for first place in the Western Conference of the Alliance of American Football. In the first quarter, the Stallions got the ball past the goal line with a Taylor Bertolet 32-yard field goal at the 9:17 mark in the first quarter. They took possession of the ball to start the game; moving it 53 yards before the drive stalled; as they settled for three points. The Commanders responded four and a half minutes later with a 75-yard drive that ended when quarterback Logan Woodside (above right) with a 21-yard pass to wide receiver Mekale McKay for the first touchdown of the game. The conversion attempt failed when a Woodside pass to Greg Ward, Jr. was incomplete. Williams came off the bench after Woodside left the game with a shoulder injury. He engineered a nine-play, 70-yard drive; concluding with a 36-yard pass to running back Trey Williams (shown left) for the score. The successful conversion; a pass from Willians to Ward, Jr. pushed the Commanders total to 17. Salt Lake cut the San Antonio lead to two after their late touchdown, with the final score being posted after the interception on the conversion attempt. Early in the first quarter, on a second-and-two play, quarterback Stallions' Josh Woodrum handed the ball to running back Terron Ward for the first down. On the play, Ward was stopped by linebackers Joel Lanning and Shaan Washington. Lanning injured his shoulder on the play and left the game. He was checked by team physicians and returned to the game in the third quarter. HOUSTON, TEXAS (March 16, 2019) The Houston Dynamo welcomed the Vancouver Whitecaps to BBVA Compass Stadium for a 2 p.m. game on Saturday, downing their MLS opponent by the score of 3-2. While the cannon didn’t fire on cue to open the match; the Dynamo defense came out swinging. Early in the game the Dynamo defense was challenged but showed their dominance in keeping the shots on goal at one. The offense was on fire, hammering Vancouver’s goalkeeper Maxime Crepeau, eight times in the first 25 minutes of play. Crepeau allowed only one Dynamo goal by Memo Rodriguez ,on a pass from Alberto Elis. A penalty kick awarded to Vancouver was taken by Fredy Montero and was successful in putting the Whitecaps on the board. Later, in the 37th minute and after a video review, Alberto Elis scored putting the Dynamo up 2-1. At the end of the first half of play. the Dynamo found themselves up by one goal up. The defense and offense ramped things up by showcasing extraordinary skills to keep the Whitecaps at bay during the three minutes of stoppage time, as shown by the fourth official. At the start of the second half, a yellow card was issued to Memo Rodriguez in the 49th minute. The Dynamo had sparks of life early in the second half, but failed to capitalize on several attempts, causing a turnover to allow the Whitecaps to even the score up at two in the 54th minute. There was a corner kick, taken by Lundquist, that the Dynamo could not connect into the goal, sending the ball over the top of the crossbar. The offense shows a few sparks of life, but was having a hard time putting the ball in the back of the goal. The Vancouver defense was proving to be a big problem for the Dynamo in the second half and the Houston was having problems getting through them. After the offense hammered the goalkeeper, Rodriguez broke through the defenses and scored again in the 74th minute. An injury happened when a Whitecaps player Andy Rose collided with Manotas and was helped off the pitch by the staff. Manotas returned to the game after being patched up. Vancouver would continue to play a man down due to using all of their substitutions. Mauro Manotas was substituted in the 88th minute and the crowd thanked him for his service to the game and his club. This match was his 100th appearance in an MLS match. Romell Quioto received a yellow card after a hotly contested penalty call. Both sides had tempers flaring and the referees were giving the whistles a workout trying to get the game back under control. From this call to the end of the game, both sides were fired up trying to hammer at the other’s goal, but neither connecting. The game ended with a corner kick being called, but not completed. KATY, TEXAS (March 16, 2019) Establishing a Southland Conference tournament record, Abilene Christian's Breanna Wright (left) was 16-of-16 from the free throw line in leading the No. 4 Wildcats to a 88-79 win over the No. 1 Lamar Cardinals; securing a place in Sunday's final tournament final against No. 6 Texas A&M-Corpus Christi. Her performance at the line established new tournament records for free throw points and free throw percentage. She scored 31 points, tying a career high she set on February 2, 2018 against Sam Houston State. Her 16 free throw points was also a season high. The win pushed ACU to a 22-9 record going into Sunday's tournament final. The Wildcats trailed by seven (68-61) will just over five minutes to play, with Wright hitting 10 of her free throws, along with a three-pointer, and assist and a steal in the final five minutes. ACU only lead for 7:27 and was down by 11 points at the 3:14 mark of the second quarter. KATY, TEXAS (March 15, 2019) No. 6 Texas A&M-Corpus Christi Islanders threw caution to the wind and came out swinging as they knocked of the No. 2 seeded Nicholls State Colonels by the score of 69-56 in the second round of the Southland Conference Tournament. The wins sets up a Saturday, March 16 meeting with No. 2 seed Stephen F. Austin. The closest the defending Southland Conference champions ever go was when they took a two point lead at the 9:11 mark of the 1st quarter. After that, is was all Islanders, leading by as much as 18 midway through the final period. The Colonels trailed in almost every statistical area, including rebounds (44-56), field goal shooting (32%-29%), turnovers (16-10), points in the paint (24-40), second chance points (11-25), fast break points (14-20), and bench points (14-20). TAMU-CC used a balanced attack, with 12 players seeing playing time and eight scoring. Emma Young tallied the game's only double-double (10 points, 13 rebounds), with Alexes Bryant and La'Janeira Robinson scoring 14 each, and Dalesia Booth added 10. Three players scored 11 points each for Nicholls; Adrian Mann, Cassidy Barrios, and Tykeria Williams. KATY, TEXAS (March 15, 2019) No. 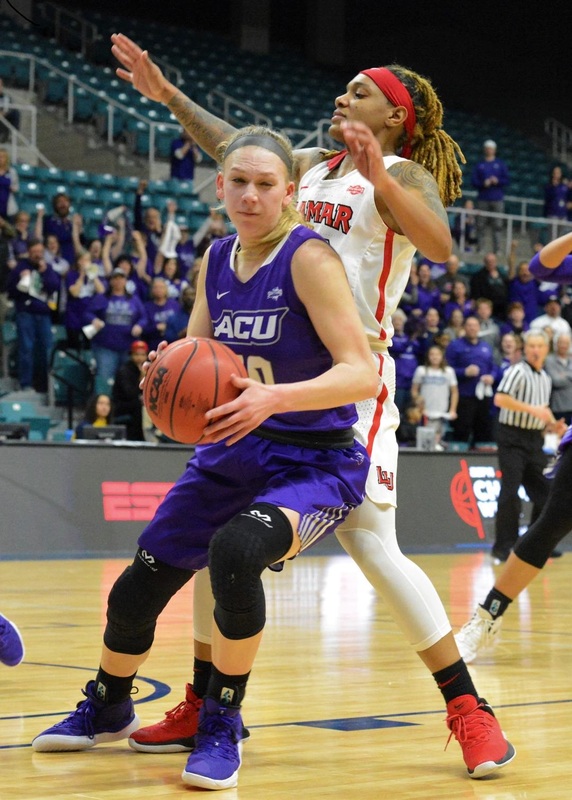 4 Abilene Christian pushed their season record to 21-9 as they downed No. 8 Central Arkansas by the score of 82-54 in the second round of the Southland Conference Basketball Tournament in Katy, Texas. The win sets the Wildcats up for a Saturday, March 16 semi final match up against the No. 1 seeded Lamar Cardinals. The Wildcats wastes little time in knocking the Sugar Bears out of the tournament. The jumped out to a 16-15 lead after 10 minutes of play; ending the first quarter with a 5-0 run. They extended their lead in the second quarter, outscoring their Southland Conference opponent 22-6; to take a 38-21 lead at the half. They also outscored the Sugar Bears 44-33 in the second half. The trio of forward Lexie Ducat, and guards Breanna Wright and Sara Williamson all scored in double digits, with Ducat and Wright tallying 14 points each, followed by Williamson with 11. Ducat and forward Makayla Mabry both pulled down eight rebounds to lead the game, with 15 of their 16 total coming on the defensive end of the court. Wright's three-pointer to end the first half gave her 999 career points and her seven assists have her four assists away from 400 for her career. Kamry Orr carried the banner for Central Arkansas, scoring 13 points, with Alana Canady adding 11. Hannah Langhi had seven rebounds in the loss. Previously this season, the Wildcats faced Lamar on February 6, dropping a 63-60 decision at home. The Cardinals bring a 24-5 record into the game, along with a 17-1 conference record. Their only loss in conference play was to No. 2 Stephen F. Austin; a 70-58 loss in Nacogdoches. The game is set for a 1 p.m. tip off on Saturday and can be viewed in ESPN+. KATY, TEXAS (March 14, 2019) The Lamar Cardinals battled back from a nine-point deficit at the 17:20 mark of the second half to cut the New Orleans lead to one with 59 seconds remaining in the game, but it was not enough. The No. 5 seeded Cardinals fell to the No. 4 Privateers 76-74 in the second round of the 2019 Southland Conference Men's Basketball Tournament in Katy, Texas. The crowd at the Merrell Center saw Lamar trailing by one with less than a minute to go when a three-point jumper by Bryson Robison sealed the deal and sent the Cardinals back to Beaumont. Lamar had won their last eight games, and finish the season with a 19-13 record. On the other hand, New Orleans edged the Cardinals on second chance points (15-11), with most other stats being equal. Robinson lead the Privateers with 17 points, followed by Scott Plaisance with 16 and Jorge Rosa with 13. Plaisance also pulled down seven rebounds to lead his team. Nick Garth, who started at guard for Lamar tallied 28 points, shooting 8-of-16 from the field including 4-of-7 from the arc and 8-of-9 from the line. Forward Josh Nzeakor accounted for 11 of Lamar's 37 rebounds, including seven of the Cardinals' 13 rebounds on offense. He also scored 12 points, to go along with the 14 points that Davion Buster chipped in off the bench. New Orleans will meet up with the No. 1 seeded Sam Houston State Bearkats on Friday, March 15 with a 5 p.m. CDT start. The game will be available for viewing on ESPN+. KATY, TEXAS (March 14, 2019) Led by Kamry Orr's 29 points and 13 rebounds, the No. 8 Central Arkansas Sugar Bears downed No. 5 Sam Houston State by the score of 76-71 in the opening game of the 2019 Southland Conference Women's Basketball Tournament in the Merrell Center in Katy, Texas. Click on the inserted video as Sugar Bear head coach Sandra Rushing talked with the press after the game. KATY, TEXAS (March 14, 2019) No. 7 Texas A&M-Corpus Christi jumped out to a 38-17 lead at the half in route to a 69-47 win over No. 6 New Orleans in the first round of the 2019 Southland Conference Women's Basketball Tournament in Katy, Texas. The Islanders showed no mercy to the Privateers after falling to them by the score of 56-54 on February 16 in conference action. The Islanders had three players in double digits; forward Alexes Bryant (18 points), and guards Dae Dae Evans (12) and Emma Young (10). Forward Tiana Matthews tallied nine rebounds for TAMU-CC. Shania Woods carried the banner for the Privateers with 15 point and 13 rebounds. The Islanders next opponent will be No. 3 Nicholls State on Friday, March 15 with a 1:30 p.m. CDT start. The Colonels finished the season with a 20-10 mark, along with a 14-4 conference record. They downed the Islanders 85-55 earlier in the season, in their only other match up of the season. KATY, TEXAS (March 13, 2019) Central Arkansas exacted revenge from an mid-season loss to Texas A&M-Corpus Christi, downing the Islanders 73-53 in the first round of the Southland Conference tournament in Katy, Texas. The No. 7 Bears, as a result of the win, advanced to the second round, where they will face the No. 3 seed in the tournament, Southeastern Louisiana. Central Arkansas held an 11-point lead at the half, 36-25, and went on for the win to push their season record to 14-18. They will be facing a Louisiana team that posted a 16-15 record in 2018-19, along with a 12-6 record in conference play. On Janaury 2, the Bears dropped an 87-75 decision to the Islanders to kick off their conference slate. In the first between Central Arkansas and Northeastern Louisiana, on Janaury 5, the Bears topped the Lions 73-71 on the road. In their second game in Hammond, the Lions came out on top, 75-67. Central Arkansas was paced by Thatch Unruh, who scores 21 points. Three other Bears scored in double digits; Hayden Koval (15), Matthew Mondesir (13), and Deandre Jones (11). Koval also led all players with 11 rebounds. The Islanders were led by Jashawn Talton with 17 points, and Jake Babic with 16. KATY, TEXAS (March 13, 2019) In a game that saw both teams shooting over 40%, the No. 8 HBU Huskies came up short, falling to the No. 5 Lamar Cardinals 81-79 in the first round of the Southland Conference Men's Basketball Tournament at the Merrell Center in Katy. The Huskies got off to a fast start in the first half and trailed 33-32 at the half. Lamar went on a 11-4 run to start the second half, which forced HBU head coach Ron Cottrell to call a time out in an attempt to get back control of the game. The Huskies battled tooth-and-nail with the Cardinals, but the game came down to rebounding and free throw shooting. Lamar pulled down 43 rebounds, with the Huskies managing only 28. Lamar shot 17-of-22 (77.3%) from the line, while HBU was 19-of-22 (62.9%). The Cardinals were led by junior forward Josh Nzeakor, who tallied 25 points and pulled down 13 rebounds. The Mesquite native tied his season high in rebounds and his 25 points was the second best performance of the season. In addition, teammates Jordan Hunter scored 18, followed by Nick Garth and Edwin Jeudy with 10. Jalon Gates came off the bench to lead the Huskies with 19 points, followed by Edward Hardt with 16, while Braxton Bonds and Oliver Lynch-Daniels added 10 each. HBU finishes the season with a 12-18 record and will return 10 players for 2019-20. They will be losing guard Stephen O'Suji, center Edward Hardt, and guard Braxton Bonds to graduation. Next up for Lamar will be a 5 p.m. CDT match up against No. 4 New Orleans tomorrow (Thursday, March 14). The Cardinals will take a 20-12 record into the game, with the Privateers posting a 17-12 season and a 12-6 conference record. 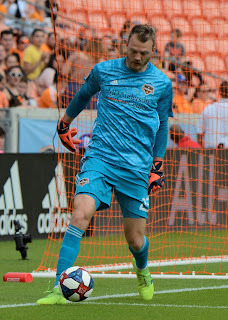 MONTERREY, MEXICO (March 12, 2019) Despite excellent defensive play by goalkeeper Joe Willis (shown left), the Houston Dynamo fell to Tigres UANL by the score of 1-0 in the second natch of their two-game series of the CONCACAF Champions League on Tuesday, March 12, 2019. With the win, combined with their 2-0 victory on Tuesday, March 5, Tigres wins the series by the aggregate score of 3-0. They will advance to the semi-finals of the tournament against Santa Laguna, with the first leg being played April 2-4. The second leg will take place on April 9-11. Willis' play in the first 68 minutes was impressive, tallying four saves. In the 68th minute, defender Carlos Salcedo got the ball past Willis for the lone score of the match. The two best chances for Houston came in the 23th and 29th minutes when midfielder Tommy McNamara had opportunities to score. In the 50th minute, forward Mauro Manotas took a hard shot at the net; which went high. Captain DeMarcus Beasley saw 19 minutes of action prior to being replaced, for what was described as "tactical reasons" by Adam Lundkvist. Lundkvist had three corner kicks along with great defensive plays. Next up for Houston is Saturday. March 16 meeting with Vancouver Whitecaps FC. Kickoff is set for 2 p.m. CDT.